Five players shared the first round lead in the Alfred Dunhill Links Championship as the sun shone in Scotland and three of the most formidable links courses in the world yielded birdies galore. At St Andrews, England’s Richard McEvoy, France’s Alexand re Kaleka and Chile’s Mark Tullo shot eight-under-par 64s, which were matched by England’s Tom Lewis and Oliver Wilson at Kingsbarns. Carnoustie’s defences proved a little more resilient, but Wales’ Jamie Donaldson powered his way around the course in a seven-under-par 65. Also one shot behind are Scotland’s leading challenger George Murray and England’s Matthew Baldwin, Tommy Fleetwood and Mark Foster. Some of the big names expected to make the running, including no fewer than 14 Major Championship winners, were left somewhat in the shade, the head of that group being 2011 Masters champion Charl Schwartzel four shots behind after his 68 at Carnoustie. The most sat isfied golfer of the day was probably Oliver Wilson, who has struggled to revive his game over the last few years and who stepped up from the Challenge Tour to compete in the Championship. After playing in the 2008 Ryder Cup at Valhalla, losing a play-off to Miguel Angel Jimenez at the BMW Championship the same year and finishing tied second with Rory McIlroy at the 2009 Alfred Dunhill Links, three shots behind Simon Dyson, he lost his playing card on the European Tour in 2011 and returned to the Challenge Tour. He said: “I’m playing a lot better. For the first time in probably over a year I actually have some control over my shots and I’m able to trust my swing under pressure. I wasn’t able to get the ball on fairways and if there was any wind, I was really in trouble. So it’s nice that Dunhill gave me an invite to this event, because it’s going to be a great test. Especially at Carnoustie and St. Andrews, you’re going to really ha ve to stand up and hit some tee shots. There was plenty of local enthusiasm for the performance of Murray, who finished third in the Alfred Dunhill Links two years ago. After a faultless round, which included a stunning run of five birdies from holes three to seven on the Old Course, he said: “I’m really happy. I’m just delighted to be playing to be honest because I got an invite. And to shoot 65 is even better. Partnering the professionals are an enthusiastic group of talented amateur golfers, who compete for the Alfred Dunhill Links Team Championship which includes Hollywood actors Andy Garcia and Hugh Grant, plus an A-list group of showbiz stars, including Don Felder from The Eagles, Riverdance idol Michael Flatley, Kyle MacLachlan of Desperate Housewives fame and actors James Nesbitt and Luke Wilson. A trio of Britain’s greatest sporting knights – Sir Ian Botham, Sir Bobby Charlton and Sir Steve Redgrave – lead a locker room of sports legends, which features cricketers Mark Boucher, Jacques Kallis, Allan Lamb, Mark Nicholas, Andrew Strauss, Michael Vaughan and Shane Warne, Dutch football giants Johan Cruyff and Ruud Gullit, rugby stars Sean Fitzpatrick and Rob Louw and popular former British tennis No.1 Tim Henman. 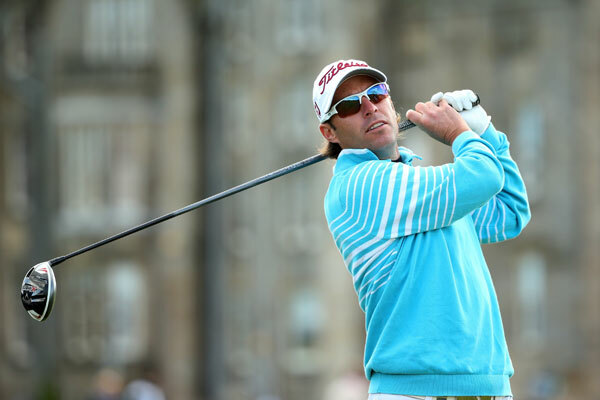 Leaders in the Team Championship are English professional Richard McEvoy and New York banker Michael Zankow, who were playing at St Andrews. McEvoy said: “I had a lovely day and holed from 90 yards on the 9th, my last hole. A great way to finish. We had a fantastic day with my partner, Michael. We dovetailed really well. I was eight-under and we were 16-under as a team.” They lead by four shots from Alexandre Kaleka & Richard Grindon and Thomas Levet & David Sayer.